The Heartland Christian Academy Music Department consists of General Music classes for K4 through 5th grade students. We focus on teaching steady beat, proper vocal singing and the basics of becoming an independent musician. Instrumental Studies are offered in 5th grade through 12th grade. The Beginning Band class invites students in grades 6 through 12 to begin a new instrument. It also allows for students that have learned an instrument to explore other playing options. Everything that we do as a music department is with the purpose of building a base from which students can grow. 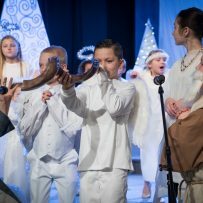 Whether it is singing, playing an instrument, or expression through musical productions… all of these things have the goal of raising worshippers for Jesus in every aspect of their lives.